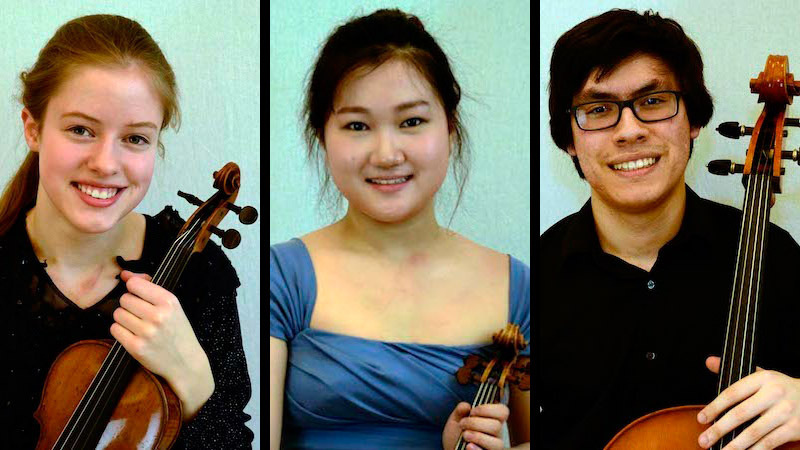 August 8, 2017, 11:53 AM · Applications are open for the 2018 Johansen International Competition for Young String Players, which will take place March 14–17, 2018, in Washington, D.C.
2015 winners: Lara Boschkor; Hae Sue Lee and Zlatomir Fung. To apply, please click here. The application deadline is Dec. 1. The triennial competition offers prizes in three separate categories: violin, viola and cello, for young string players ages 13 through 17 years (born March 18, 2000 to March 17, 2005). Awards for each category include a $10,000 first prize, $7,000 second prize and $5,000 third prize. There is also a $1,000 prize for best performance of the commissioned work, "Johansen," by Joel Phillip Friedman. Winners also may receive performance opportunities and scholarships. Jury members include Chee-Yun, Timothy Deighton and Peter Stumpf. The competition was established in 1997 by the Friday Morning Music Club. First-prize winners in 2015 were violinist Lara Boschkor; violist Hae Sue Lee and cellist Zlatomir Fung; here is a complete list of past winners. Ida Kavafian: How are Competitions Beneficial?